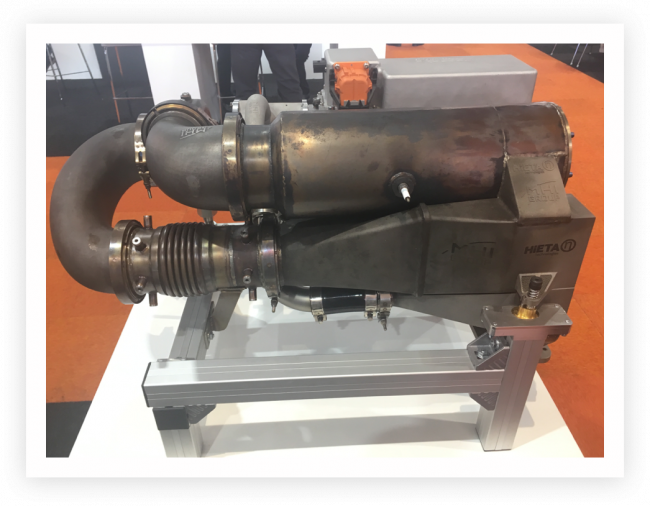 HiETA is pleased to announce that our SLM recuperator technology has been used in the Mitsubishi Turbocharger and Engine and Europe (MTEE) range extender product, RANGE+, unveiled at the International Motor Show IAA in Frankfurt, Germany, on September 14th 2017. MTEE, a Mitsubishi Heavy Industries Group company, have developed a power generator capable of rapidly charging the battery of a battery electric vehicle (BEV) while driving. The RANGE+ allows for fast recharging, increased driving distance and independence from recharging infrastructure. 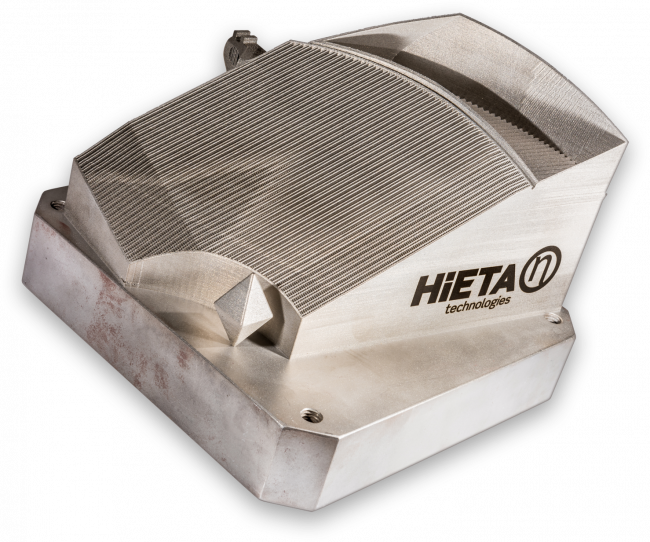 HiETA has developed a highly efficient recuperator specifically for the RANGE+ engine. Made using Laser Powder Bed Additive Manufacturing from Inconel 625. HiETA worked closely with MTEE during development to understand the system requirements. The solution delivered employs HiETA’s proprietary heat transfer surfaces along with integrated manifolds to reduce piping losses. 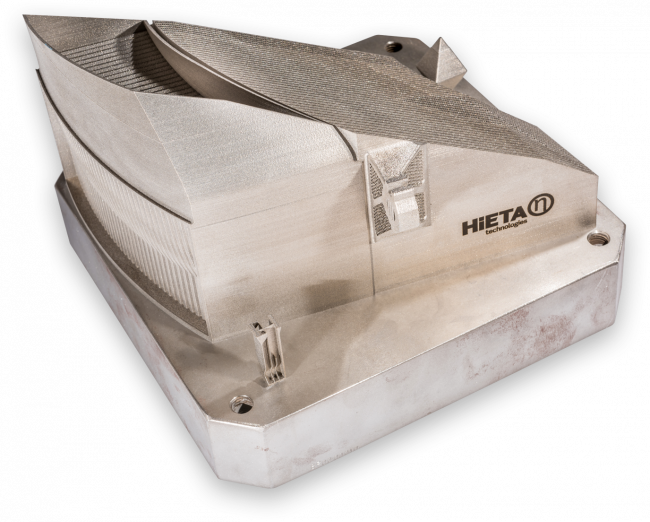 HiETA also designed and manufactured an optimised diffuser to ensure good flow distribution and heat transfer. The unit is also HiETA’s largest ever heat exchanger, a laser-welded assembly of 5 separate AM components. The RANGE+ prototype is based on proven turbocharger and gas turbine technology; it uses a gas turbine to drive a generator that charges the battery. In addition to this, its inherent high power-to-weight ratio and low number of parts allows compact, lightweight and cost-effective designs. Furthermore, BEV’s will be more affordable to manufacture and have a further reduced environmental footprint because, with the RANGE+, a smaller battery pack will be sufficient to power the vehicle. Advanced combustion combined with the right matched turbocharger technology, leads to a low combustion temperature, and thereby low emissions. The system incorporates a recuperator, which recovers exhaust heat to improve the cycle efficiency. The future series production version of the RANGE+ will be designed with low NOx emissions and to comply with the SULEV 2025 (California) emission standard.